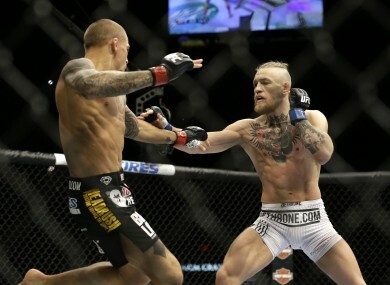 Dustin Poirier and Conor McGregor in action during their September 2014 bout in Las Vegas. IT’S NOT OFTEN that Conor McGregor meets his match when it comes to verbal warfare, and given that he took less than two minutes to defeat Dustin Poirier when they met at UFC 178, he probably had the edge here too. Nevertheless, Poirier — who lost to the current UFC featherweight champion via first-round TKO in September 2014 — deserves some kudos for his response to McGregor’s latest social media output. This line of work is not for everyone. But it's steak every night. Fresh from his impressive win over Donegal’s Joseph Duffy last weekend at UFC 195, Poirier was quick to respond. The American fighter took to Instagram to post an image from Duffy’s submission of McGregor in November 2010. The caption? Bonus points too for the Happy Gilmore reference. Just give it a little tappy tap…. Email “Poirier hits back with smart response to McGregor's social media dig”. Feedback on “Poirier hits back with smart response to McGregor's social media dig”.